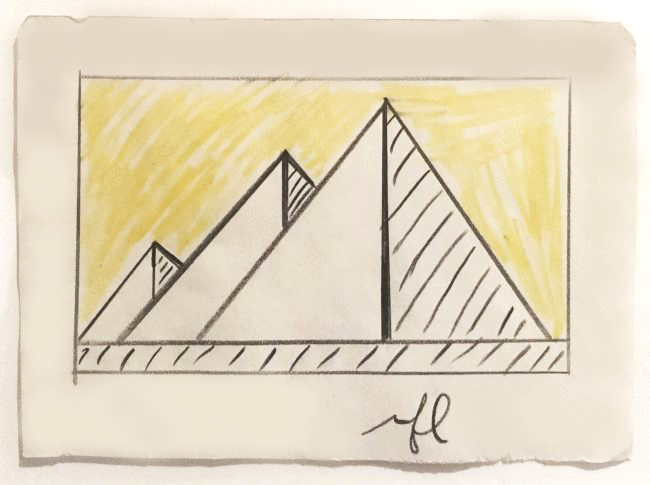 Roy Lichtenstein’s Pyramid Study of Egypt’s Pyramids of Giza, exemplifies how he used small colored-pencil drawings as templates for his final renderings. We see his trademark use of primary colors, in this case, only black, white, and yellow, and simplified outlined images. Roy Lichtenstein’s Pyramids Study of Egypt’s Pyramids of Giza, exemplifies how he used small colored-pencil drawings as templates for his final renderings. We see his trademark use of primary colors, in this case, only black, white, and yellow, and simplified outlined images. Roy Lichtenstein was a pop art painter whose works, in a style derived from comic strips, portray the trivialization of culture endemic in contemporary American life. Using bright, strident colors and techniques borrowed from the printing industry, he ironically incorporates mass-produced emotions and objects into highly sophisticated references to art history.He was one of the first American Pop artists to achieve widespread renown, and he became a lightning rod for criticism of the movement. Born in New York City in 1923, Lichtenstein studied briefly at the Art Students League, then enrolled at Ohio State University. After serving in the army from 1943 to 1946, he returned to Ohio State to get a master’s degree and to teach. Through the 1950s, Lichtenstein used the basic techniques of abstract expressionism, but incorporated into his compositions such themes as cowboys and Indians and paper money. In 1961, however, while at Douglass College, impressed by the work of colleague Allan Kaprow, he turned to the use of comic-strip and cartoon figures by which he is known today. Flatten… sandfleas (1962, Museum of Modern Art) was the first important example of his new style. Primary colors–red, yellow and blue, heavily outlined in black–became his favorites. Occasionally he used green. Instead of shades of color, he used the benday dot, a method by which an image is created, and its density of tone modulated in printing. Sometimes he selected a comic-strip scene, recomposed it, projected it onto his canvas and stenciled in the dots. “I want my painting to look as if it had been programmed,” Lichtenstein explained. In 1967 his first museum retrospective exhibition was held at the Pasadena Art Museum in California. Also in this year his first solo exhibition in Europe was held at museums in Amsterdam, London, Bern and Hannover. He married his second wife, Dorothy Herzka in 1968. In the 1970s and 1980s, his work began to loosen and expand on what he had done before. He produced a series of “Artists Studios” which incorporated elements of his previous work. A notable example being Artist’s Studio, Look Mickey (1973, Walker Art Center, Minneapolis) which incorporates five other previous works, fitted into the scene. In the late 1970s, this style was replaced with more surreal works such asPow Wow (1979, Ludwig Forum für Internationale Kunst, Aachen). In 1977, he was commissioned by BMW to paint a Group 5 Racin g Version of the BMW 320i for the third installment in the BMW Art Car Project. In addition to paintings, he also made sculptures in metal and plastic including some notable public sculptures such as Lamp in St. Mary’s, Georgia in 1978, and over 300 prints, mostly in screen printing. Inquire Guy Hepner Contemporary Art Gallery in NYC via email or phone about prices to buy pop artist Roy Lichtenstein artworks, nudes, interiors, paintings, prints, canvases and other art for sale.